Welcome to part 2 of Dragonfly’s new global eco-fiction series, where I explore fiction from around the world dealing with environmental crises. 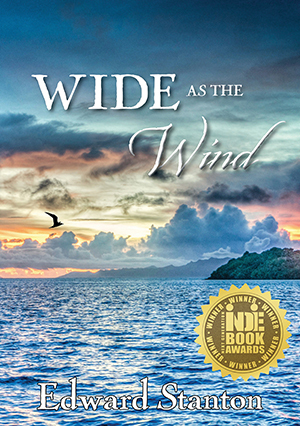 In this feature, I cover the novel Wide as the Wind, by author Edward Stanton, who landed on the idea for his award-winning book during a trip to Easter Island, situated 2,300 miles west off the Chilean coast and 2,500 miles east of Tahiti. He conducted much of his research for Wide as the Wind on Easter Island itself. He is the author of eleven books, some translated into Spanish, Arabic and Chinese. He has published fiction, poetry, essays and translations in journals throughout the U.S., Latin America and Europe, where he has lectured at universities and cultural centers. Stanton has been a Fulbright fellow in Argentina and Uruguay and has received grants and fellowships from the National Endowment for the Humanities, the U.S. Department of Education and the government of Spain. He was named the A.R. 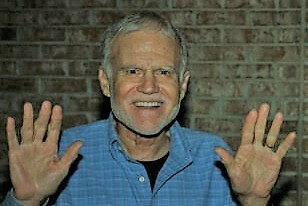 Sánchez Distinguished Lecturer at Texas A&M International University in 2003 and Distinguished Alumnus at UCLA in 2007. Averaging 13 feet (4 meters) high, with a weight of 13 tons, these enormous stone busts–known as moai–were carved out of tuff (the light, porous rock formed by consolidated volcanic ash) and placed atop ceremonial stone platforms called ahus. When Polynesian explorers first arrived between 800 and 1200 AD, the island landscape was lush with palm forests. The prevailing theory holds that settlers’ slash-and-burn farming practices led to extreme deforestation, explained [paleoclimatologist Nick] Balascio, an assistant professor of geology at William & Mary. Diamond’s theory suggests that such deforestation caused serious erosion of the volcanic-rich soil around the island. Famine, in-fighting, cannibalism, and lack of fresh water and food resulted. Eventually, the island’s great palm forests vanished, and the population dwindled. In 1772, on Easter Day, Dutch sailor Jacob Roggeveen navigated to the island–his contact was followed by Spanish sailors in November of that year, and later the French. By the mid-19th century, Peruvian contact stole nearly all the remaining population and made them slaves, resulting in just a little over one hundred islanders left. Smallpox had also been introduced. In the end, the most intriguing questions remain still unanswered: Did the former inhabitants destroy completely the island’s dense subtropical forest, causing their own demise? Was Rapa Nui since the beginnings of human colonization a poor environment, covered only with local spots of forest and was it a drought, maybe in combination with human impact, that finally triggered the extinction of the already rare plant species? Did the natives realize the impending change–did they even care? Worship of the mythological half-man, half-bird figure appeared on Rapa Nui sometime during the 1500s, replacing the ancestral worship typical throughout Polynesia and emblemized by its giant stone guardians. Believers toppled many of the ancient statues and destroyed smaller ones. While there are more than 1,800 petroglyphs and stone houses in the ceremonial village of Orongo, where the Birdman cult was centered, Hoa Hakananai’a was the only moai to survive—and only after the winged symbolism was added. So what caused this seismic shift in sacred beliefs? The general consensus is that the avian adulation grew from environmental stresses. Located nearly 3,000 miles off Chile’s coast, Easter Island is one of the most remote places on the planet. When Polynesians first arrived there, it was as verdant as the Hawaiian archipelago; but after hundreds of years of deforestation, the island was barren by the time the first Europeans arrived in 1722. With their gods and earthly rulers seemingly failing them, inhabitants abruptly abandoned moai carving and turned to their warrior class or matatoa for guidance. The birdman cult was taken over by Christian missionaries later in the 19th century. Prior to then, it is suggested by History.com that the cult of the birdman had been a way of recognizing the destruction of the environment with the birth of a new ideology that would better balance power versus resources. The sooty tern (and its eggs) remained a food source. The novel was just awarded the 2018 Feathered Quill Award for Teen Fiction and also was the winner in 2017 for the Next Generation Indie Book Award for Young Adult Fiction as well as the Moonbeam Award for Young Adult Fiction. Mary: Can you tell us how you were inspired to write the book? Edward: When I read Jared Diamond’s famous article about the collapse of Easter Island’s habitat, titled “Easter’s End,” in Discover magazine (August 1995), I wondered if anyone had ever written a novel about this momentous event that is a cautionary tale for our times. I could not find such a book in any language. Years later, after reading everything available and traveling to Easter Island, I realized that ecological disaster could be a powerful subject for a novel. With a great sense of responsibility, I began writing. Mary: What’s it like on the island? Edward: Rapa Nui has an austere beauty of its own. Imagine a place that somehow combines the Black Hills of South Dakota, the prairies of the Midwest, extinct volcanoes on an island whose coasts are dotted with monolithic moais or ancestral statues, all of it surrounded by the bluest ocean you can imagine. It’s unlike any other place in the world. Although it’s Polynesian in its location and in the culture of its people, the climate is subtropical; it can be cold and rainy, and there are no tiki bars. Mary: Can you tell us about the novel–what takes place, the main characters, the young adult/teen heroes? Edward: Wide as the Wind is above all a story of love and adventure, but it also deals with deforestation and the collapse of a natural habitat on a prehistoric Polynesian island. It could be compared to the Disney film Moana, but there the environmental destruction is attributed to a cartoon monster; people, not monsters, were the real cause. When his island is ravaged by war, hunger and destruction, Miru, the fifteen-year-old son of a tribal warrior, must sail to a distant island in order to find the seeds and shoots of trees that could reforest their homeland. If he decides to undertake the voyage, he must leave behind Kenetéa, a young woman from an enemy tribe with whom he has fallen deeply in love. And if Miru and his crew survive the storms, sharks and marauding ships that await them on a journey over uncharted ocean, an even greater mission would lie ahead. They must show their people that devotion to the earth and sea can be as strong as war and hatred. Miru and most of the other main characters of the novel are teenagers, but the novel has also appealed to older readers and been chosen by adult reading clubs. Mary: The trailer looks like a movie trailer, and is so gorgeous. It’s a movie I would go and see. The trailer is also how I first found your book. You’ve traveled quite a bit throughout your life, and you also wrote about your long walk on the Camino de Santiago, from the French Pyrenees to Santiago de Compostela in northwest Spain. Doing such a walk is my personal dream, so I’d love to hear more about your travels, including that journey. Mary: Well, someday I hope to write to you about my own journey! What sort of changes have you seen around the world that could be attributed to climate change and other ecological collapse? And, getting back to Wide as the Wind, how have such islands as the fictional one in your novel actually been affected in real life? What are you seeing as you travel there? How have rising seas and intensity of storms threatened people, landscapes, cultures? 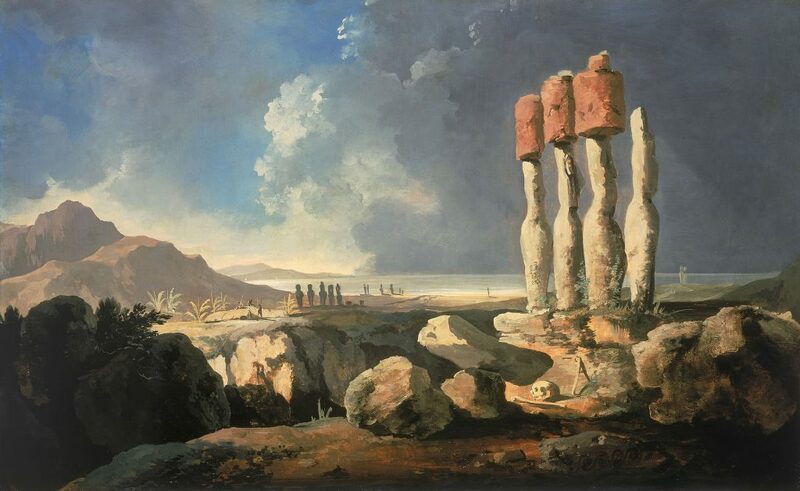 Edward: After being deforested some 600 years ago, Rapa Nui (Easter Island) is still mostly bare of trees. In other words, what a people does to its habitat at a given time can have enduring consequences. In Wide as the Wind, I give the island another name–Vaitéa, which means “white water”–in order to expand the book’s imaginative reach to all of Polynesia. In addition to Rapa Nui, numerous other Pacific Islands have been deforested, depleted, fished out and seen their habitats decline: the Cooks, Wallis and Futuna, parts of French Polynesia and Hawaii. Rising seas and climate change will harm many more islands in the Pacific and other oceans. Mary: How important do you think it is, in fiction, to tackle such issues, and how do you think fiction can reach the heart (unlike data, news)? Edward: A good question that contains part of a good answer. It is one thing to read an article, essay or nonfiction book about environmental disaster, and another to see how it shatters a person’s and a people’s lives. Good fiction may seem more real than our everyday existence, and we may come to know a novelistic character better than we know ourselves, our family or friends. Mary: What are you working on now? Edward: Sir Richard F. Burton, the great British explorer and writer (for whom the actor was named), used to work on a dozen or so books at a time. I’m only working on two: a travel memoir based in Mexico and Spain, and a literary thriller set in the aftermath of the “Dirty War” in Argentina. Mary: Sounds great, Edward. I’m looking forward to seeing what’s next. Today Rapa Nui (now owned by Chile) is a World Heritage Site and has around 6,000 inhabitants. It’s a big tourist destination, bringing in 80,000 visitors a year. If this isolated paradise wasn’t first devastated by Polynesian culture, further crises now result from waste and plastic. According to the BBC, tourists produce 20 tonnes of rubbish per day, including 40,000 plastic bottles per month. While these can be recycled, much of the island’s garbage ends up in landfills, which attracts mosquitoes, dogs, and rats. Waste has to be fumigated to mitigate dengue, a mosquito-borne virus. With more people wishing to make the island their home, mostly in order to start new tourist shops and restaurants, over-fishing has also become an issue. 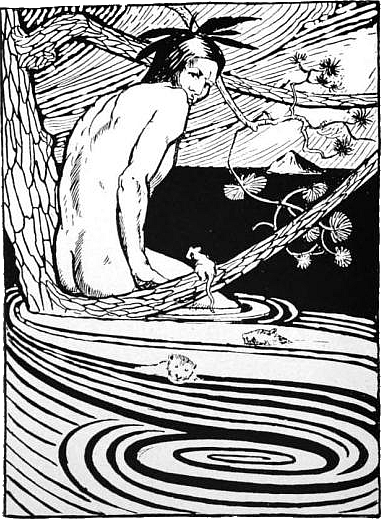 Stanton’s tale imagines early Polynesian island culture and how things might have been different today if a young adult hero, such as Miru from the novel, decided–with the help of a priestess–to reforest the island, which would have led its people down a different path. The story is well-written: a coming-of-age hero story with love at is essence. One can sense that even though this haunting tale is beautiful and immersive, we can also infer from it a modern perspective of how cultural expectations can be broken in order to achieve something positive and fair. For instance, when Miru’s uncle gives him permission to sail to another island for seeds, he allows Renga Roiti (Miru’s sister) to go, when girls would not have been allowed to go on such a boat journey. After all, Renga Roiti’s totem sisters were the sooty terns that produced such sacred eggs. We also can look at the novel as a drawn-out fable, something we can learn from. But such a lesson is one we should already know, one we have not abided by. So reminders are good, I think. We may look at the island of Vaitéa as a microcosm of our present Earth, and if we zoom out, it’s easy to wonder: what have we learned in the last few centuries? 80% of the world’s forests have been destroyed, according to the Global Forest Resources Assessment (2010). We are still destroying them, even though many modern-day Mirus exist. The nearly 1,000 moai, erected between the 10th and 16th centuries on Rapa Nui (also named Easter Island by an 18th-century Dutch explorer), are being battered by rising sea levels, high-energy waves and increased erosion, as detailed on March 15, 2018, in The New York Times. Ancient human remains are buried beneath many of the works, which appear as giant faces gazing over land and sea. “Some of the moai have been knocked over in the past — including by tsunamis — and they have been restored. So not every site is in pristine condition,” says Adam Markham, deputy director of climate and energy at the Union of Concerned Scientists. “The difference now is that the danger is even greater. The rate of change is faster than ever.”…As Markham points out, all of the world’s islands have been made vulnerable to erosion with rising ocean levels. Some climate models predict that increased melting of the world’s ice sheets could cause oceans to rise by 5 or 6 feet (1.5 or 1.8 meters) by the year 2100. Higher sea levels mean shores face flooding and inundation by crashing waves. It seems that islands like Rapa Nui were doomed from the beginning, from long-ago locals destroying natural resources and now also from the world at large doing the same, and either of these scenarios fares badly for the island. In the global eco-novel, there is a chance, I think, to speak to all readers’ hearts, no matter where we live, with the pure imagination of storytelling that reminds us of things and people we love, and how we can save them. In the novel, Muri has a quest to save his island. Perhaps we should go on the quest to save our world. Thanks to author Edward Stanton for looking at a delicate area in the world and engaging in its historic culture in order to bring such an imaginative cautionary tale.